Changing your bathroom suite is a big project, but once you have your new bathroom fitted, you want it to stand the test of time. Consequently, it is important that you make the right decision when it comes to its style and size. In the latest blog post from EGP Plumbers, we discuss top tips for choosing your ideal bathroom suite. With so many designs on the market, it is important that you carefully weigh up the pros and cons of each design, and consider how it will work for your family in long run. 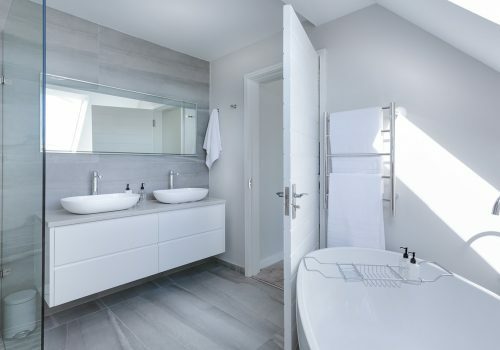 Contemporary bathrooms typically make use of clean lines to keep the aesthetic elegant and modern. Contemporary suites also often make use of strong shapes, such as rectangular sinks or bold, round options. When hunting for your perfect contemporary bathroom suite, you may notice that there is a wider range of sizes in contemporary styles, which can be ideal for cloakrooms and en-suites. Traditional style bathrooms typically encompass features such as a roll top bath and classic additions such as a high cistern toilet, producing the feel of an Edwardian or Victorian style of bathroom. Traditional bathrooms don’t need to feel dowdy or old fashioned and you can still enjoy the perks and practical nature of mixer taps and rainforest shower heads. To create your perfect bathroom, be sure to measure the space carefully. If you are limited on space, opt for alternatives such as short projection toilets and hung basins. Here at EGP Plumbers, we supply a bespoke bathroom design service and can install your new bathroom suite hassle free. If you would like more information on our wide range of services, we welcome you to contact us. Please call today on 0116 264 5115. Alternatively, head over to our online enquiry form and we’ll get back to you shortly. ← What Are My Gas Safety Responsibilities?